From 1:00-4:00 on February 2nd, Pack 3322 is scheduled to snow tube at Brandywine Ski Resort in Northfield. For $20 per tuber, you will have unlimited snow–tube rides. Most everyone can tube. The only restriction is the tuber has to ride in his or her own tube. If you just want to watch, you can do that too for no cost. There is a lodge where you can warm up as needed and get snacks and hot chocolate. Lockers can also be rented. Please consult the FAQs found here for more information. Regardless of if you show up on time or late, you will need to be done tubing at 4:00. 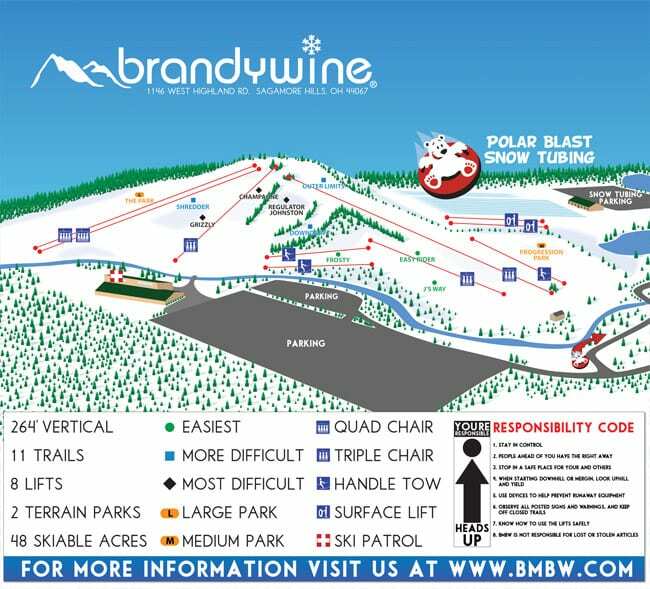 Brandywine has a snow machine for the tubing hill, so the event is snow or shine. There are also lifts for you and your tube, so you don’t need to walk back up the hill after each run. The Boston Mills Brandywine Ski area is actually two resorts. Snow tubing is at the Brandywine Resort located at 1146 W. Highland Road, Northfield, Ohio. When you pull in, do not go to the main parking area (which is for skiing). Instead, once in the driveway, make the hard right before the main parking area. See this road map and this resort map (look for the polar bear in a tube at the bottom right of the map and the snow tubing parking lot on the right side of the map). There is a waiver that all tubers must execute prior to tubing. It can be found here. Bring the executed waivers with you to the slopes. All participants must also have a medical form on file with the Pack. If you plan on joining us for snowtubing, please join the Pack’s GroupMe by clicking here.